Salmon Forks is one of the few places to legally target native bull trout. 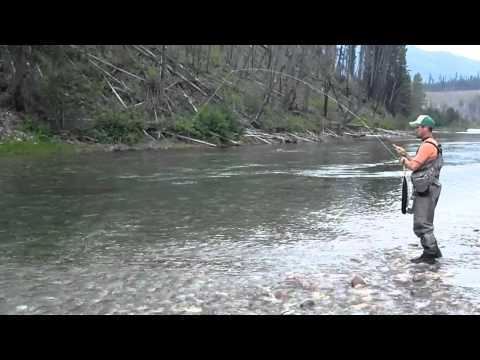 Our location is known as the best fishing on the South Fork River corridor by locals and guides alike; and our base camp is a stones-throw from the wild hatchery. 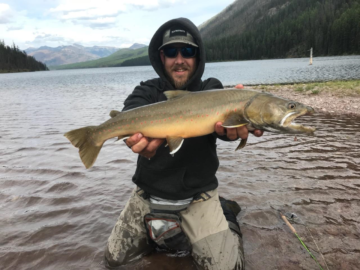 Bull trout are known to grow up to 36” in this fishery, so if you are looking to catch that fish of a lifetime, you have come to the right place. Walk-and-wade fish before breakfast or in the evening, no need to pack-up camp to float, or ride away from the prime habitat. Anglers choose Salmon Forks Outfitters for this specific trip because of the ease of access from base camp, the angling opportunity to target westslope cutthroat and bull trout in the height of the season, and for the relaxation that comes with a fully-guided Montana fishing trip in the Bob Marshall Wilderness. Bull trout season ends July 31, if you want to target bull trout schedule a trip prior to that date. We can custom design this highly sought-after trip in the month of July, and highly recommend the July 14 – 22 time-frame for optimal angling conditions to target bull trout.